Sponsored & hosted by Wapping Wharf. Decorated by Amy Ponting. This piano is no longer available to play as its sponsor Wapping Wharf have kindly donated it to Knowle West Healthy Living Centre. Staff at Knowle West Healthy Living Centre welcome one of the #bristolstreetpianos that was kindly donated to the centre by its sponsor Wapping Wharf. 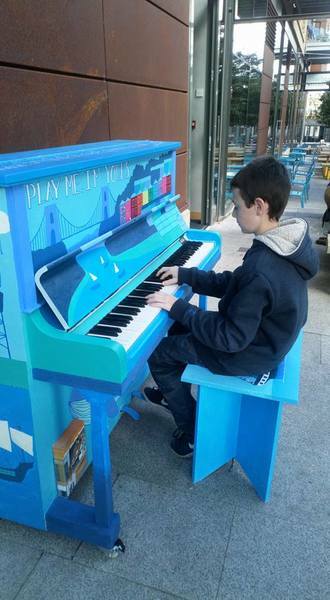 Lovely to see so many families out enjoying our pianos. Very scary first ever public performance - only started learning the piano 3 years ago, so very proud of myself! At the end of the Bristol Rovers - Fulham match (3-2, as I learned later), these 2 gentlemen weren't done singing yet. 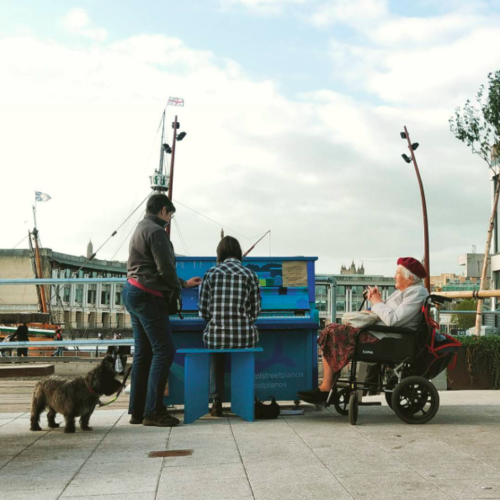 I was happy to be at the right time at the Wapping Wharf piano to catch their enthusiasm and utter joy! Thanks both and who knows, see you next year...?! 13 Pianos played. Just stopping off near M Shed! Lucky to meet the artist as well! Jordan from Mokoko Coffee & Bakery who are hosting the piano at Wapping Wharf for the first week trying out the piano this morning. Steve playing The Entertainer this morning - this is a really lovely piano to play. Jordan, the manager at Mokoko Coffee & Bakery, was there to welcome the piano when it arrived this morning. He's a great pianist so hopefully he'll be entertaining people when he's not serving customers! 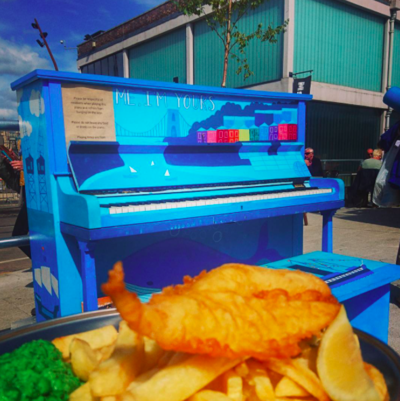 What a fabulous location for this piano! Why not pop in for a coffee and play the piano whilst you're there? 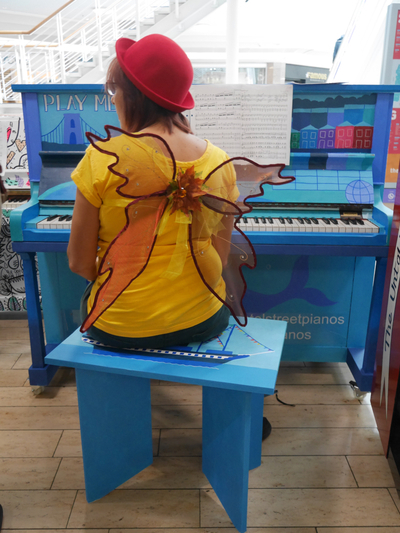 A member of the Fantasy Orchestra playing the Wapping Wharf piano at the media launch at The Galleries on 14 August.